Preheat oven to 180°C. Brush four holes of a muffin pan with melted butter to lightly grease. To make the filo pastry cups, first cut the filo sheets in half, then place in a stack and cut into quarters. Pace one square in each muffin tray and brush with melted butter. Repeat this process five times, until the filo has formed a cup shape. Cook in oven for 5 minutes or until just crisp. To make the filling, beat the ricotta and eggs together in a medium bowl until combined. Mix in the parmesan, shallots, dill and chilli flakes. Season with salt and pepper. Remove the filo cases from oven and fill with the egg mixture. Reduce the oven temperature to 160°C and cook for a further 10 minutes. Arrange slices of smoked salmon on top of each cup and sprinkle with chopped capers. Garnish with extra dill. 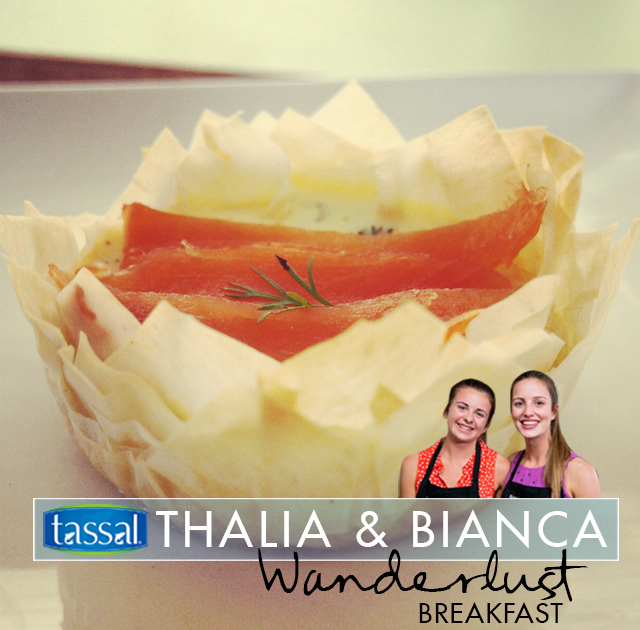 *Recipe developed by Bianca Johnston and Thalia Papadakis.